These tips are all for the Blogger platform, as that's what I use, but they probably also apply to other platforms, you'll just have to figure out where to find the options. Even if you don't use Pinterest or Facebook to share your posts, chances are someone else will, and everything will work better and look nicer if you've used the "search description" and "image properties" fields in your post. 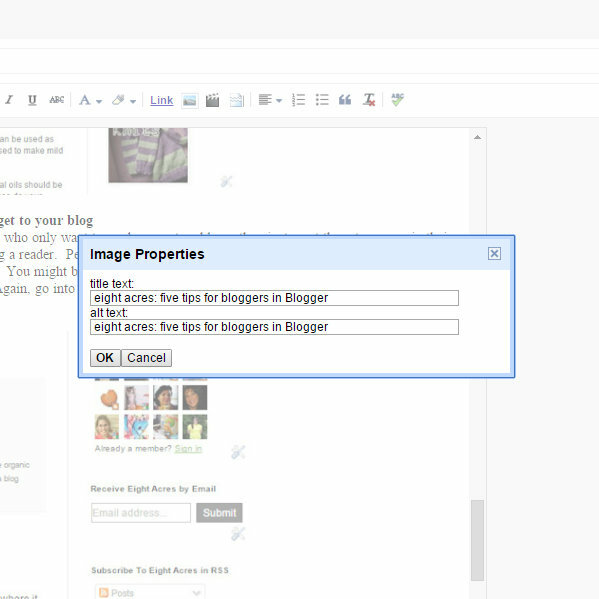 In Blogger the search description is a text box on the righthand side in the "post" screen between "location" and "options". If you click on the text you will see it opens up a box where you can type anything. When your post is shared in facebook this is the text that appears with your post. If its blank you get the text in the first comment (I figured this out by trial and error). The first comment is not always what you want to see, so I suggest that you write something short in the search description box instead. For example, I usually write something like "eight acres: post about blogging tips". When you pin a post in Pinterest, the default text that comes up for the description is the image properties, sometimes this is blank or a filename. If you want to take control over what people use in Pinterest to describe your post, you can help out by typing something useful into the image properties. 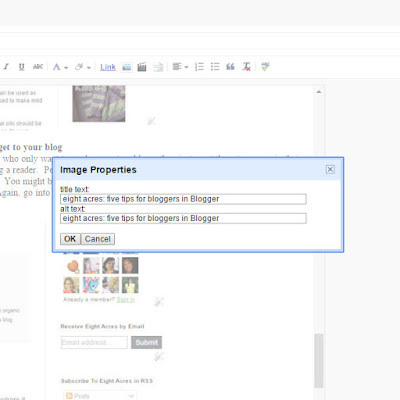 To get to image properties in Blogger, just click on the photo and then select properties from the menu that appears, this will give you a box with two text areas, I usually type the same thing in both, similar to what I type for search description. Do this for EVERY photo, as you don't know which one people will pick to pin. You can also do a fancy photo with words for extra Pinterest appeal, but I don't have time for that! People can change the text in Pinterest, but if they are in a hurry you have saved them some time as they can just save that pin and move on without thinking what to type. On the topic of Pinterest - do try to include a photo in every post, even something irrelevant is better than nothing - so that people can pin your post if they want to, posts with no pictures cannot be pinned. A few people asked me about my new logo so I thought I'd better share how I created it. I don't think a logo is essential, but if its something you are interested in doing there are a few options. I found two different sites that allowed you to design a logo from stock drawings by changing colours and adding text (here and here). You can then purchase either the basic package or more expensive options. For the cheaper package you don't own the logo, they don't take it off the website and other people may use it also, however once you've changed colours and added text it is different to the original. They are similarly priced, so I recommend you search through both and see which has the logo that suits you best. I took the cheap option, so my logo is still available for anyone to use. A still more expensive option is to have a logo designed by a graphic designer, there are various sites where you can ask for designers to pitch ideas and you buy the one you like. I didn't want to go to that level. 3. Use a custom banner - but not too BIG! I read somewhere that lists of labels are out of fashion on blogs. You might have noticed that many blogs are using images instead now, and they are really easy to set up. 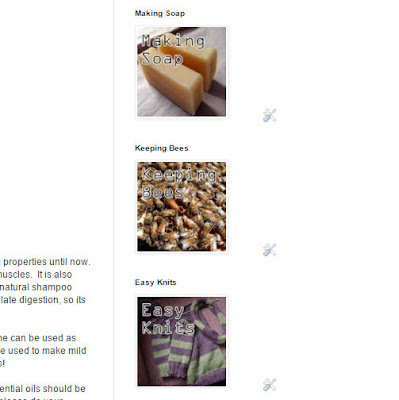 Just pick your popular labels, I currently have knitting, bees, soap, books and herbs. I chose an image for each and made a new image with the words over it and exported them in a standard pixel size to fit on my sidebar. Then you just go to "layout" and add a gadget - select photo from the list of gadgets. Upload your photo and the appropriate link to the label (just click on the label from a post to find the link). Its all explained properly in this post. You can change these regularly to direct people to your areas of interest. There are a few people who only want to read one or two blogs, they just want them to appear in their email, rather than using a reader. Personally I use Bloglovin to read many blogs, however Pete prefers to receive emails for the blogs he reads, and some of my family have also subscribed this way. You might be missing out on these readers if you haven't added the email gadget to your blog. Again, go into "layout", add a gadget and select "follow by email" to add this option. Bonus tip! Publish your entire post in RSS, please! If you read blogs in a reader, posts that are not selected to publish in full may only give you a few sentences. Unless those sentences or the blog title are REALLY interesting, I will not click further and read the whole post, I just can't be bothered waiting for it to load. I'm sure I'm not the only one who does this, and I make this comment only because I know that not everyone uses a reader app and may not be aware that this happens. If you go into "Settings" and the "other" menu, you will find options for "Site Feed". 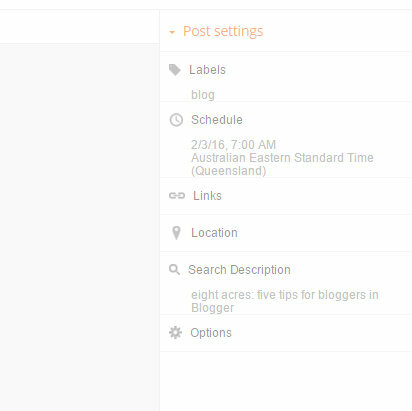 Check that "allow blog feed" is set to "full", which will mean that your entire post can be accessed from a reader such as Bloglovin. You may chose to use another option so that people have to go to your website to see the full post and then they will see your advertising or whatever else you want people to see on your site. 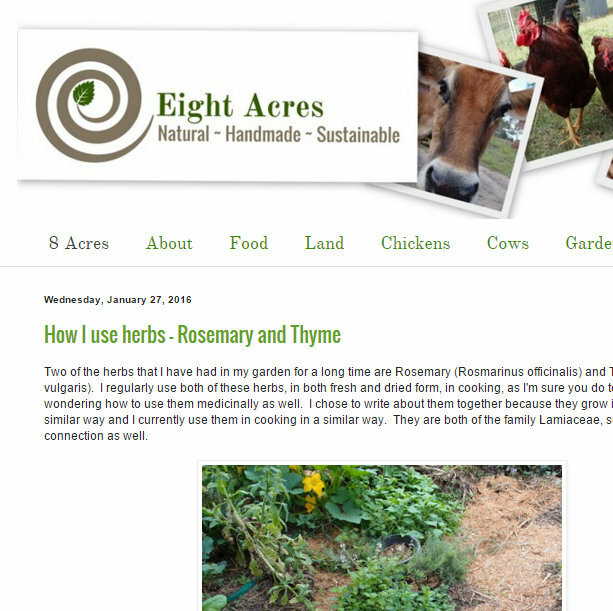 You can also add a "Post feed footer" which will appear after each post that is accessed through a reader. Note that these setting also apply to posts that are received by email in tip 5.. If you want to know even more, Weed em and Reap recently published an excellent tutorial on setting up a blog. I thought some of it was a bit over the top, and I would suggest starting small if you're not sure how much you're going to end up writing. I don't want you to be put off by all the detail in that tutorial, there are some great ideas and some that you don't need if you just want to start a small blog. Thanks for sharing your tips, Liz. I have a few more ideas now. 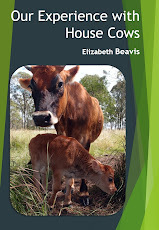 Thanks for the tips Liz, and for taking the time to share them. There were a couple of tips I hadn't read about before and I will check the links out too. Thanks heaps. haha, yep, sometimes I see something on a blog and wonder how it was done, I've benefited from many posts where bloggers have shared there tips! 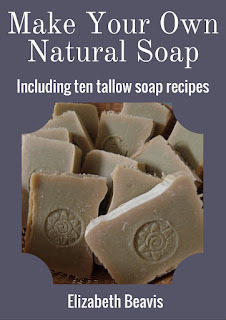 just caught up with some of your other posts too, i think your new logo spiral would look great on your soaps too! 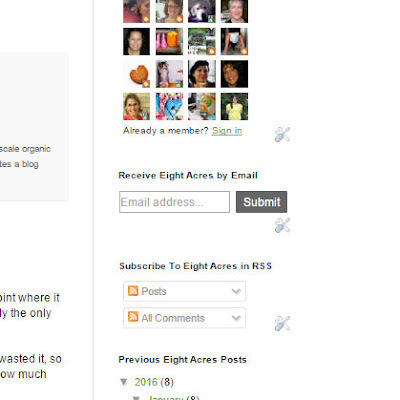 Thanks Selina :) I hope some of my tips can help you if you decide its worth fiddling with your blog layout! WOW!! this is really terrific THANKS!! i learned some tips. yay! Thanks so much for that. Obviously, I've got plenty of work to do still. Nice of you to share your findings!!! Here's another tip. 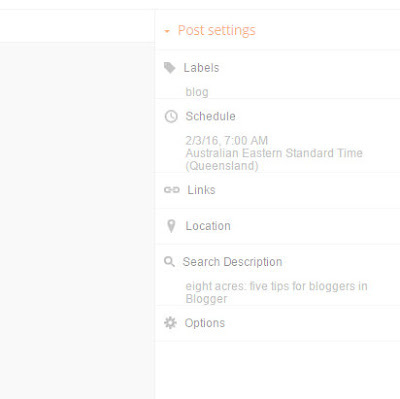 Another useful feature of Blogger is the private setting. I've used this since 2008 for several reasons. For example it's quite useful when you first start and you're mucking around changing templates etc. I often recommend new blogger bloggers keep it private for their first 20 posts, and then go public. You can keep it just you or you can set it to only readers you invite, which is what mine is now. Obviously this isn't an option for someone into collecting likes / fans / followers you know the numbers game. But I wanted a blog originally for family and friends, and the privacy setting was ideal. Anything I want public I run through my blog's Facebook page. Interesting - I am uncertain if I have all of these features happening...I will have to check. Thanks for sharing your tips, I'll be definitely saving this one to return to for more tips. I don't have the search description option any ideas why? Great post these are good tips to take advantage of. I figured it out but I am glad you posted about it as I had the option disabled. Great article, Liz! On a side note, I would add that I will never post my entire blog post in RSS. The reason being, it makes things super easy for content thieves to steal your stuff to be added to their blog. If their blog turns out to be bigger than your blog, then Google (and other search engines) will mark the post on YOUR site as duplicate content, which will knock you down in the rankings, adversely affecting your site as a whole.